🤧 This smiley shows a sad face with closed eyes, whose mouth and nose are covered with a handkerchief. This can mean that you have a cold and you are sick, feel bad or suffer from allergies. Sometimes this way you can show that you are extremely sentimental and you can burst into tears for any reason, or you already do it. 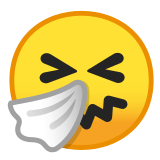 Sneezing Face Emoji was approved as part of Unicode 9.0 standard in 2016 with a U+1F927 codepoint, and currently is listed in 😀 Smileys & Emotion category. 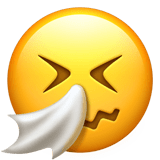 Use symbol 🤧 to copy and paste Sneezing Face Emoji or &#129319; code for HTML. This emoji is mature enough and should work on all devices. You can get similar and related emoji at the bottom of this page.